They are Bai Shuzhong, the former head of the Health Division for the Chinese PLA General Logistics Department(Download:MP3), Bo Xilai, the former head of Business and Trade(Download: MP3), and Tan Yunshan, chief physician from the Liver Pathological Department at the Affiliated Zhongshan Hospital of Fudan University, Dr. Gong of the second ward of the Cardiothoracic Surgery Department of the Affiliated Tongji Hospital of Huazhong University of Science and Technology. We carried out different investigation, include 5 members of the standing committee of the Politburo, 1 Vice chairman of the CCP’s Central Military Commission and Central Military Commission member and former defense minister. They did not deny this to the question about Organ Harvesting of Falun Gong practitioner, and some of them even gave more details. We have the testimony from a guard armed with a gun at the live organ harvesting site who has witness the whole process. 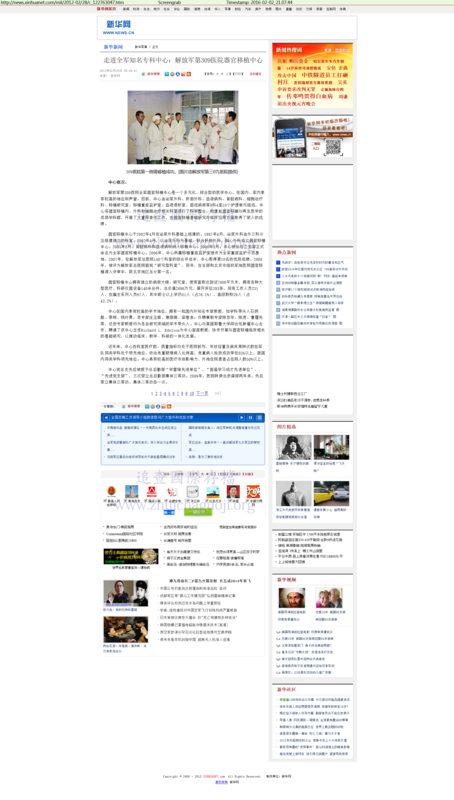 Chen Qiang, the kidney broker of kidney transplant department of the PLA 307 Hospital in Fengtai, Bejing, admitted that they are running a one-stop service of officials, police, and the prison to traffic Falun Gong practitioner's organs, and they can provide the proof of "donor is Falun Gong practitioner". Jinzhou Intermediate People's Court clearly stated that they could provide Falun Gong practitioners'organs. We have recordings of evidence of the surgeons from 30 hospitals admitting that the donor organs came from the imprisoned Falun Gong practitioners and 891 transplant hospitals and 9519 transplant surgeons suspected of involving in live organ harvesting. By April 2006, the number of hospitals performing liver transplantation in China had increased sharply to 500 from 19 prior to 1999. This was an increase of 20 times from 1999 to 2006. The cumulative total of 20-year liver transplantation before 1999 was only 135 cases in China, and the annual average numberis 6.7 cases. During the 8 years from 1991 to 1998, Chinese hospitals performed a total of 78 cases of liver transplantation, the annual average number is 9.7 cases. By contrast during the 8 years from 1999 to 2006, an astronomical 14,085 cases of liver transplantation were carried out in mainland China, the annual average number is 1,760 cases. There was a difference of 180 times. 3.1 In Tianjin First Central Hospital, there were 120 beds for transplantation patients, but added to more than 500 beds in September 2006. 3.2 Shanghai Renji Hospital only had 13 beds for transplantation patients in October 2004, but increase to 110 beds in 2014. 3.3 The Center of Organ Transplantation of Sichuan People Hospital had 8 beds, increased to nearly 100 beds in 2011. 3.4 Shanghai Oriental Hepatobiliary Surgery Hospital had 742 beds, increased to 1,500 beds in 2015. Since 1999, Chinese organ transplantation field are extremely busy in whole year, and it isn't individual or special phenomenon of the hospitals, but common situation of Chinese hospitals for whole year. According to the report fromUnited States Department of Health and Human Services in 2007, the average waiting time for a liver and kidney are respectively two and three years in the U.S.
1.1 "We have so many donor organs that you can select young and good one"
1.2 "For the waiting time of a donor organ, 2-3 days at shortest, about 10 days at longest. it costs about 500 thousands and we have many donor organs"
An emergency liver transplant is an urgent liver transplant operation performed on patients with acute, serious liver problems and less than 72 hours to live. Due to the difficulty of urgent tissue typing and the extended waiting time for a donor, emergency liver transplant operations are rarely performed outside of China. In China, however, emergency liver transplants have become a common operation since 1999. According todata from The 2006 Annual Report on China Liver Transplant Registration, 8,486 cases of liver transplants were performed in 29 transplant centers from April 6, 2005, through December 31, 2006. Among these, 4331 cases had specified whether or not the case was an emergency transplant, indicating a total of 1,150 emergency liver transplantations performed, or 26.6 percent of those cases. Such scale of urgent liver transplant and short-time for surgery both show that the hospital can get the matched organ with order, killing on demand. Many Hospitals use several spare donor organs for one case of transplant surgery. For example, the then-Vice Minister of Health Huang Jiefu demonstrated an autologous liver transplant operation at the First Affiliated Hospital of Xinjiang Medical University on the afternoon of September 28, 2005. Huang used four spare livers for the operation, three of which came from living persons. This indicates that the existence of live organ pool and its efficient operations. 4. Many hospitals conduct multiple transplant operations at the same time. Many hospitals can conduct several, or as many as several dozen, kidney and liver transplant operations on the same day, or even at the same time. Such as Xinqiao Hospital of Third Military Medical University once performed 24 kidney transplant operations in one day, Tianjin First Central Hospital also performed 24 liver and kidney transplant operations in one day, and the First Affiliated Hospital of Sun Yat-sen University finished 19 kidney transplant operation in one day. From medical view, it's impossible to find so many matching organ at the same day even using death row prisoner. In order for this scenario to be possible, China must have a massive pool of healthy captives that are imprisoned collectively. These captives must have already undergone all the matching tests required for organ transplant operations. 5. There was a rush transplantation after disclosure of Organ Harvesting, Hospitals promoted to offer free transplantation. Our investigation has confirmed that after the Sujiatun Concentration Camp in Liaoning Province was exposed on March 9, 2006, there was a peak time of organ transplantation by 2007. It showed that there were lots of living organs need to urgently deal with. CCP was in the rush to clear stock of donors. The most prominent example: on April 28, 2006, Hunan People’s Hospital advertised that the hospital offered 20 free liver and kidney transplantation including 10 liver transplantation and 10 kidney transplantation. In doctor's papers, they claimed that the donors were "Brain Dead", but In China there is still no Law of Brain Death and the diagnosis criteria as well. But we have found from 300 papers that lots of organs came from "brain death donor" before 2006. Our investigation confirmed, by 10 July 2016, that a total number of 891 hospitals and 9,519 surgeons have involved in live organ harvesting from Falun Gong practitioners. Some are large-scale hospitals, some are middle or small scale hospitals. Even hospitals such like traditional Chinese medicine (TCM) hospitals, forensic hospitals, maternity and child care hospitals and specialist hospitals participate in organ transplantation. Bed number: 393 in 2012. 3. Gongyi Chinese Medicine Hospital of Henan Province even established Kidney Transplant Center in 2001. And the transplant center's Urology director LI Hongdao has carried out more than 500 cases of kidney transplantation in 2006. 4. Peking University People’s Hospital performed 4,000 kidney transplantations once a year, the sources are all from death rows. "Before 2010 the pilot of organ donation system began, the death row are almost the all resources of Chinese organ transplantation." 5.On July 24, 2015, Yang Guang, a Chinese dissident, now living in Denmark, disclosed that there were more than 500,000 Falun Gong practitioners killed by live organ harvesting only in ordinary hospitals such like people's hospitals, municipal hospitals which do not include armed police force hospitals, military hospitals and public security hospitals. 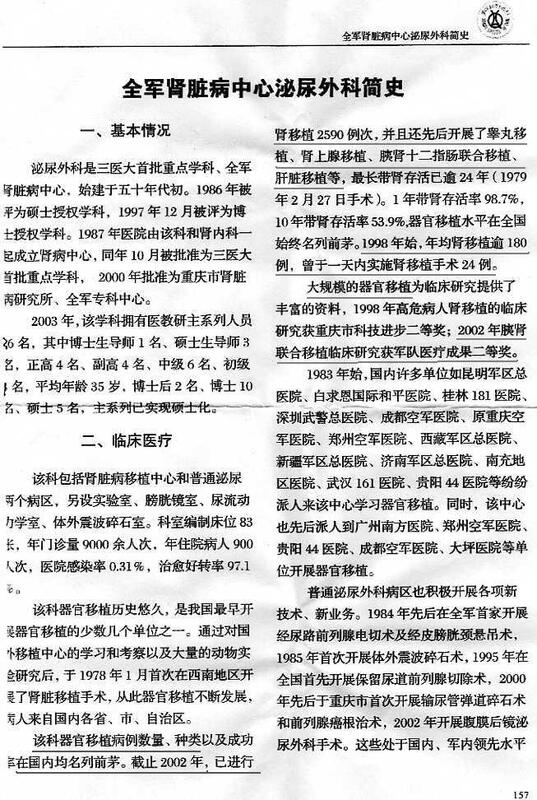 V. CCP 's propaganda of "Death Row Organ", "Citizen Organ Donation" and the so-called improvement of Chinese organ transplantation industry propagated by CCP in the 26th International Transplantation Conference are all lies existing in different periods, which all aimed to "Bleach" the crime against humanity of CCP harvesting organs from living Falun Gong practitioners. According to the records of Amnesty International, the average number of execution of death row prisoner in China between 1995 and 1999 was 1680 per year, and from 2000 to 2005 the average number was 1,616 per year. These numbers would vary from year to year, but overall average numbers before and after the persecution of Falun Gong is the same. Although this figure is likely to underestimated, even then higher figures could not explain the explosive growth of China organ transplantations after 2000. 1.The situation of the large quantity of organ transplantation, extremely short waiting time, and the adequate donor supply isn't changed. Even some hospitals provide the Green Path (Emergency Liver Transplantation) for severe patients. 3. Some hospitals admitted they were using Falun Gong practitioners' organ, and implied that they still do the same now. Even worse, Zhu Jiabin, the director of the Integrated division of 610 Office in Mudanjiang, Heilongjiang Province, directly admitted that they had harvested organs from Falun Gong practitioner- GAO Yixi, and "sold" them. He looked so unscrupulous( DownloadMP3). Just like World War II, for a long time, lots of people in international society could not believe the possibility of massacring Jews on a large scale. When the Allies captured Auschwitz concentration camp, people began to realize the enormous disaster. According to the statistic afterwards, about more than 6.000,000 Jews were planned to massacre in the concentration camps. The entire world was involved in World War II, which made mankind pay a heavy price. Today CCP persecutes Falun Gong, the sin of harvesting organs from living Falun Gong practitioners is extremely similar to what Nazi had done to Jews at that time, but the extent of its evil greatly exceed it. If the whole world does not face up to it, human civilization will no longer exist. 1. Investigate the crime against humanity committed by CCP in China thoroughly. 2. Implement universal jurisdiction over crimes against humanity under Rome Convention. And initiate the judicial investigation procedures directly once any Chinese doctor, policeman or other staff who is suspicious of organ harvesting goes oversea. 3. Ask the highest authority of China to immediately arrest Jiang Zemin and other important criminals in "610" system and to thoroughly investigate all crimes of persecuting Falun Gong. The persecution of Falun Gong is a genocide and a crime against humanity, similar in nature to those committed by the Nazis. Whoever commits the offense shall bear the responsibilities; all responsible individuals, organizations and countries shall be subject to moral and legal punishment. It is the responsibility and honor of every nation, organization and individual to take part in fully investigating and stopping the CCP’s crimes against humanity. WOIPFG (2006). Report on Liver Transplantation in 2006. China Liver Transplant Registry. Investigation of foreigners coming to China for organ transplants. (2010, Oct. 1). iFeng Weekly. Entering the Famous Specialty Center, PLA 309 Hospital. 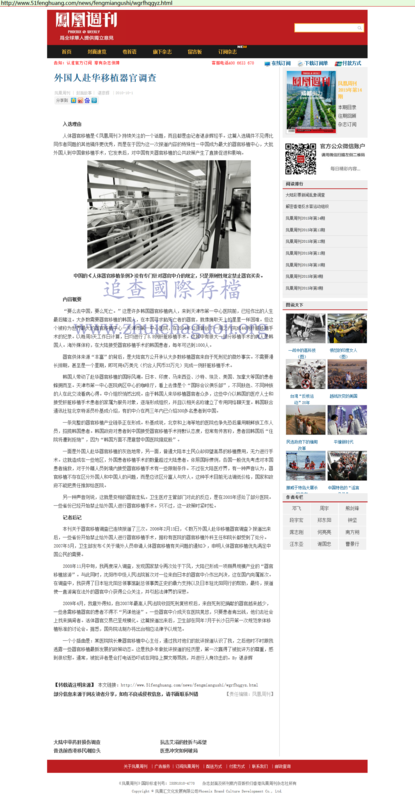 Xinhua Net.